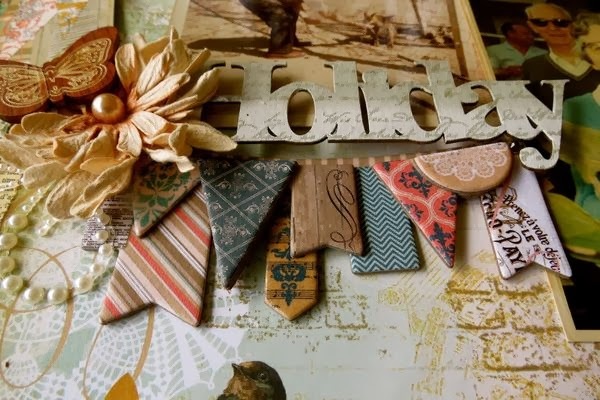 The BoBunny Blog: Trends: Feathers and Doilies and Wood..OH MY! Trends: Feathers and Doilies and Wood..OH MY! This week is all about trends! Our design team got to emphasize their favorite trends in their projects this week! What are your favorite trends? Is there a trend you would like to see our design team work with? Leave us a comment and we will work some of your suggestions into our future calendar! 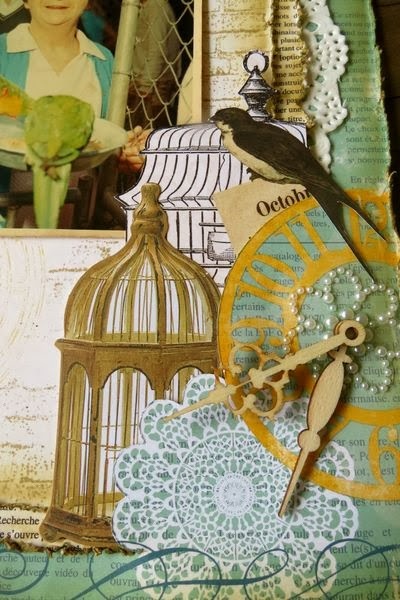 The trends which I've picked to create this layout with are watercolors and feathers. I love using watercolors on my layouts. They are so versatile that you can use it to create whatever background you want for your layout. In this layout, I've used it to add colors, masked a feather image and create a flow direction. I've used the misting and splattering techniques to create my background. To create the feel of "winter fur", I've incorporated the use of feathers on this layout. I've used the feathers and some cut out chevrons to create the flowing direction in the design of this layout. 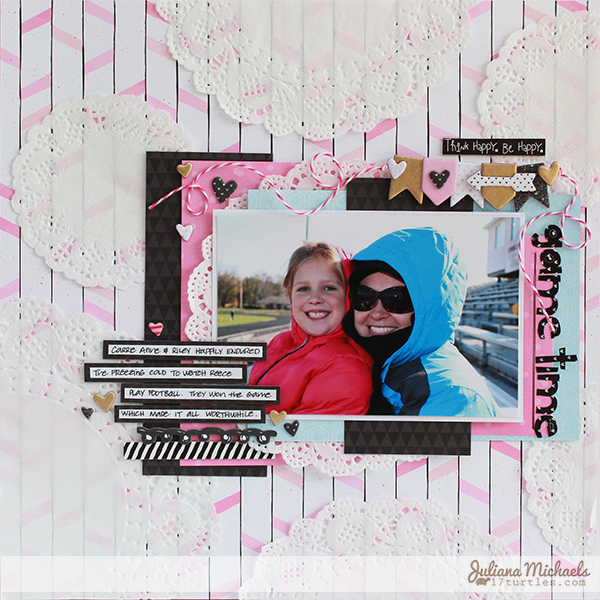 Incorporating the latest trends into your scrapbook pages is so much fun. The trends I choose to use on my layout are doilies and gold. I used the 3 different sizes of BoBunny doilies to customize my background paper. Then, I added touches of gold using a Gold Krylon Leafing Pen and chipboard from the Head Over Heels 12 x 12 Chipboard. For more details on how I created my doily background paper please visit my blog 17turtles. Every year new and exciting trends are introduced that help feed the excitement and artistic drive that scrapbooking brings. A couple of trends that I love are doilies and wooden embellishments. 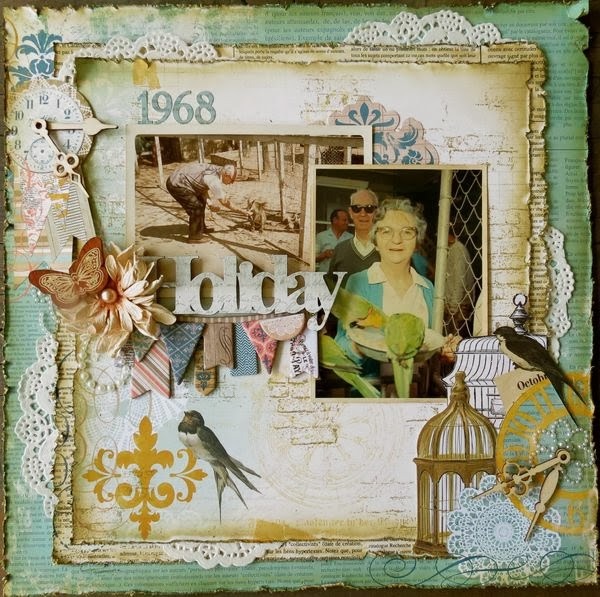 I particularly love heritage style scrapbooking and using doilies and wooden embellishments adds the perfect dimension to projects, blending together to create a softer layout. Ive cut apart some of the doilies to help them go further, and used two of the different sizes that are available. In this case Ive left them in their natural state but they can be easily altered using inks and stamps etc. Ive also kept my clock hands natural and again these are easily altered. I just love your lay-outs so much! You're showing off these trends in a fabulous way! Great layouts... Irene Tan, I LOVE your work of art/heart!!! I am going to use this as inspiration for my next layout for my own beloved furbaby/buddy... Dakota is Malamute/Collie? we think. I need to run her DNA so that I can keep her as healthy as possible, keeping our eyes out for usual breed-specific health problems. Your dog looks like my beloved Orca, now passed, who we were told was a Husky-Shephard mix, but we were later told he was probably Husky-Wolf.... again, LOVELY works of art ladies! Fabulous layouts Irene and Megan! Feathers and Doilies and Wood ... OH MY!!! Great looking projects! I like the wood and doilies also.